One of the most unique and useful products developed in recent years for keeping minnows alive during a day of fishing. BAIT-BUDDIESä are actually two products in one. Each individual container of BAIT-BUDDIESä contains both a gray tablet, which is the oxygen tablet, and a blue tablet which is the water conditioning tablet. The gray oxygen tablet bubbles all day long releasing oxygen into the water for the baitfish to utilize. The blue tablet dissolves in a matter of minutes to fully condition the water by removing harmful chlorine and heavy metals, stimulating the natural slime coating on the baitfish, adding beneficial electrolytes, reducing fungus and bacteria, and keeping the bait frisky. Once dissolved, the blue tablet leaves the water a clear blue color. The tablets are packaged in individual, moisture and oxygen proof containers. These containers are sealed with easy to open laminated foil seals, This packaging is important so that the product is kept fresh and dry until ready for use. 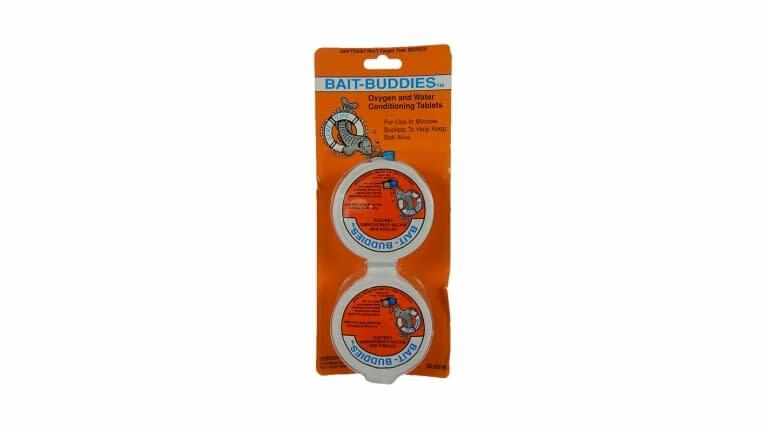 Our packaging is colorful, practical, easy to open and includes beneficial information for the live bait customer Goin' Fishin'? Don't Forget Your BUDDIES! A New Way To Treat Bait Buckets! BAIT-BUDDIESä Are Packed in Moisture Proof Containers.